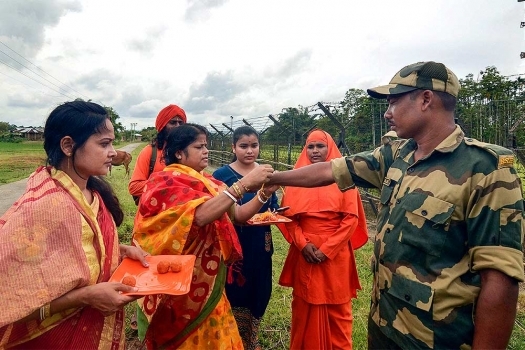 Sisters tying rakhi to their prisoned brothers on the occasion of Raksha Bandhan, at Cenral Jail in Bhopal. 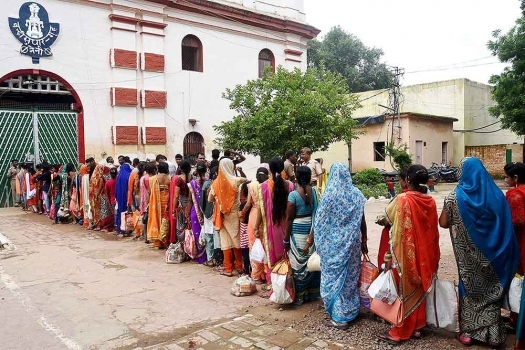 Sisters wait outside Central Jail to tie rakhi to their prisoned brothers on the occasion of Raksha Bandhan, in Jaipur. Sisters of inmates wait to tie rakhi to their prisoned brothers on Raksha Bnadhan festival, outside Naini Central Prison in Allahabad. 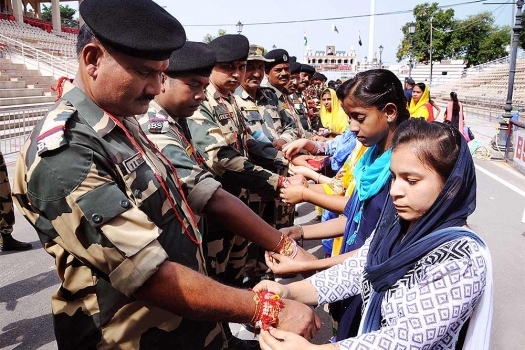 Girls tie 'rakhis' on the wrists of BSF jawans on the occassion of Raksha Bandhan festival at Attari-Wagah border post, in Attari. 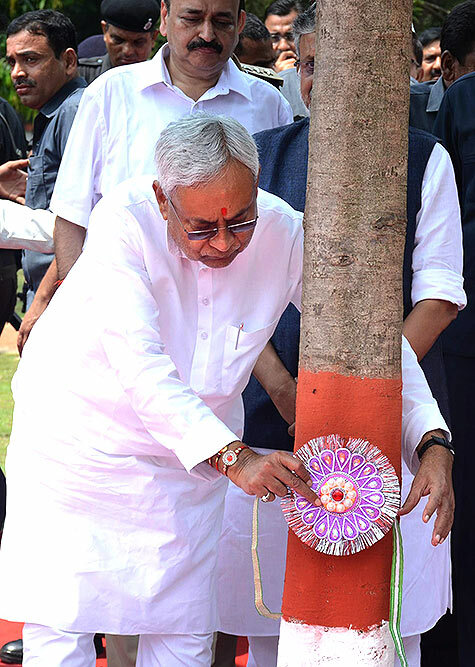 Bihar Chief Minister Nitish Kumar ties rakhi on a tree at Rajdhani Vatika during Bihar Barish Suraksha Diwas programme on the occasion of Raksha Bandhan festival, in Patna. 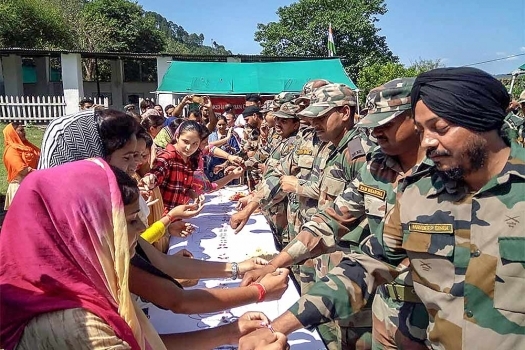 Women tie Rakhi to the jawans, posted along LoC, on the eve of the festival in Poonch. 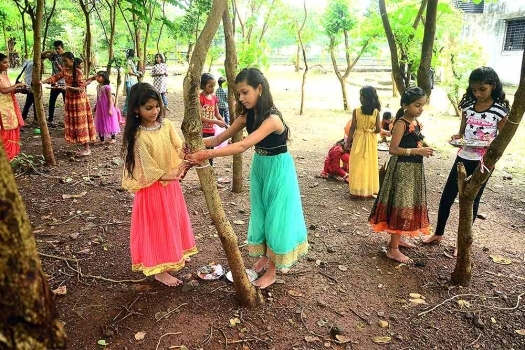 Children tie rahis to trees on the occasion of Rakshabandhan, in Navi Mumbai. 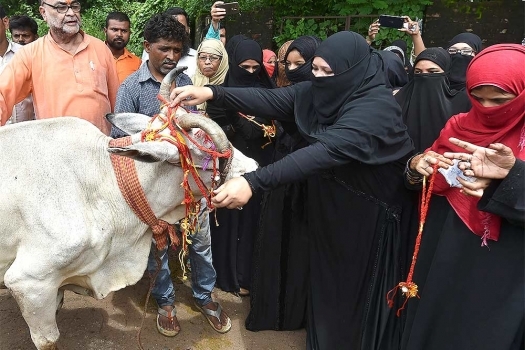 Muslim women tie rakhis to cows on the occasion of Rakshabandhan festival, in Lucknow. 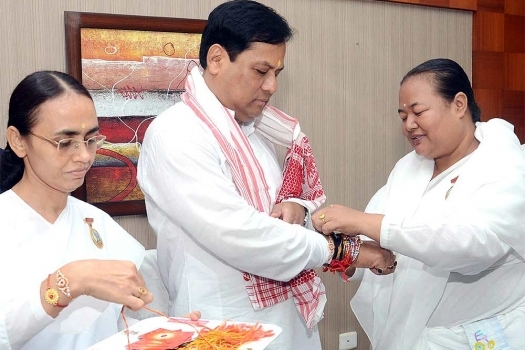 Brahma Kumaris tie rakhi to Assam Chief Minister Sarbananda Sonowal on the occasion of Raksha Bandhan, in Guwahati. 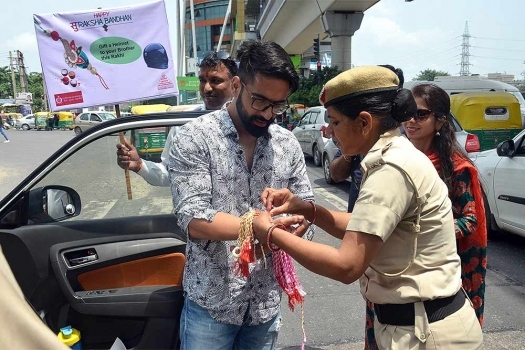 A Traffic Police personnel ties rakhi to a traffic violator on the occasion of Raksha Bandha, in Gurugram. 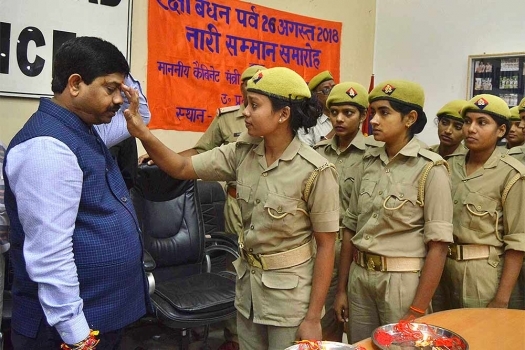 Police women tie rakhi to cabinet minister Nand Gopal Gupta Nandi on the ocassion of Rakshabandhan festival, in Allahabad. 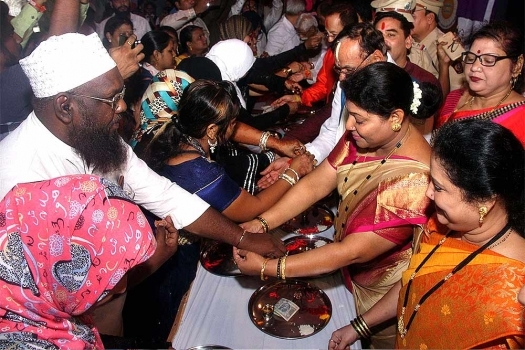 Women tie rakhis on the occasion of Rakshabandhan Festival, in Mumbai. 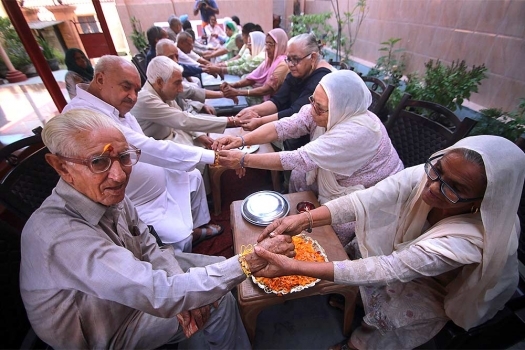 Women at old-age home tie rakhis to fellow residents on the occasion of Raksha Bandhan, in Jammu. 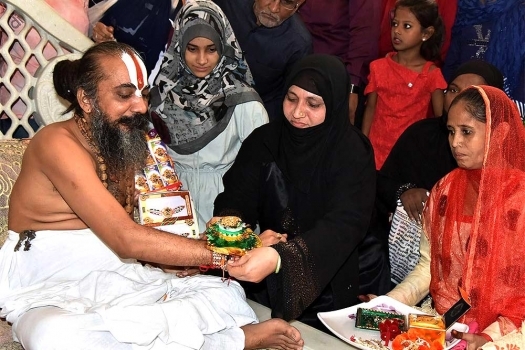 Muslim women tie rakhi onto the wrist of Lord Jagannath temple's head priest Mahant Dilipdas Maharaj, in Ahmedabad. 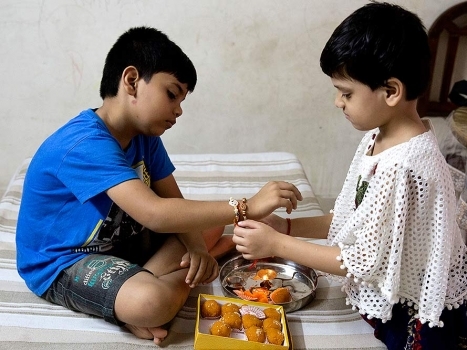 A girl, right, ties a rakhi, or sacred thread, on her brother's wrist as a symbolic gesture during Raksha Bandhan festival in Allahabad. 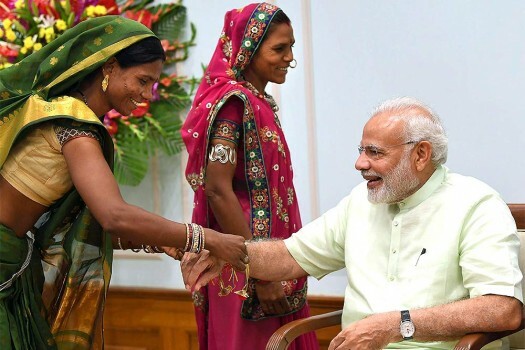 A woman ties rakhi on Prime Minister Narendra Modi on the occasion of Raksha Bandhan festival, in New Delhi. 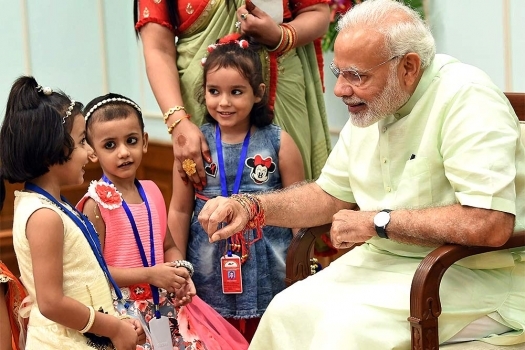 Children ties rakhi on Prime Minister Narendra Modi on the occasion of Raksha Bandhan festival, in New Delhi. 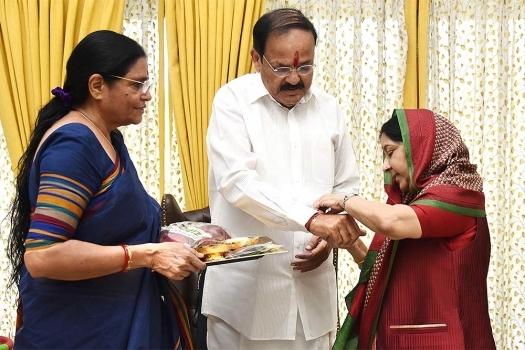 Foreign Minister Sushma Swaraj ties rakhi to Vice-President M Venkaiah Naidu on the occasion of Raksha Bandhan festival, in New Delhi. 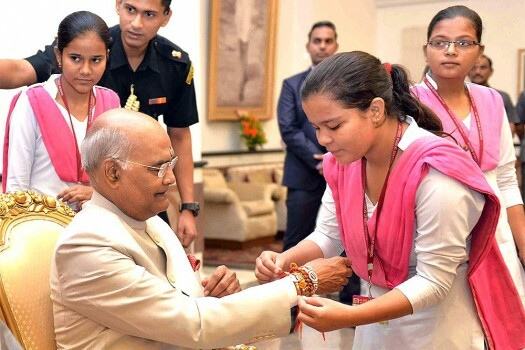 President Ram Nath Kovind meets students and children from various schools & organizations on the occasion of Raksha Bandhan at Rashtrapati Bhavan Cultural Centre, in New Delhi. The golden rakhis have been priced between Rs. 50, 000 and Rs. 70, 000. Rustle up these innovative dishes for your brother this Raksha Bandhan.